Colorado lakes, rivers and reservoirs lure fly-fishers hunting for quick-darting and hard-fighting trout. 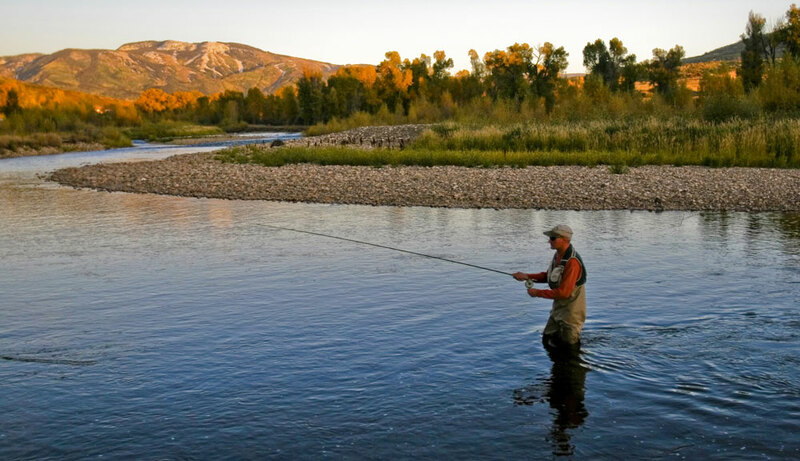 Here’s a list of fly-fishing locations in western Colorado that are sure to fill your creel. Be sure to get a Colorado fishing license before you head out, and consider hooking up with a fishing outfitter. 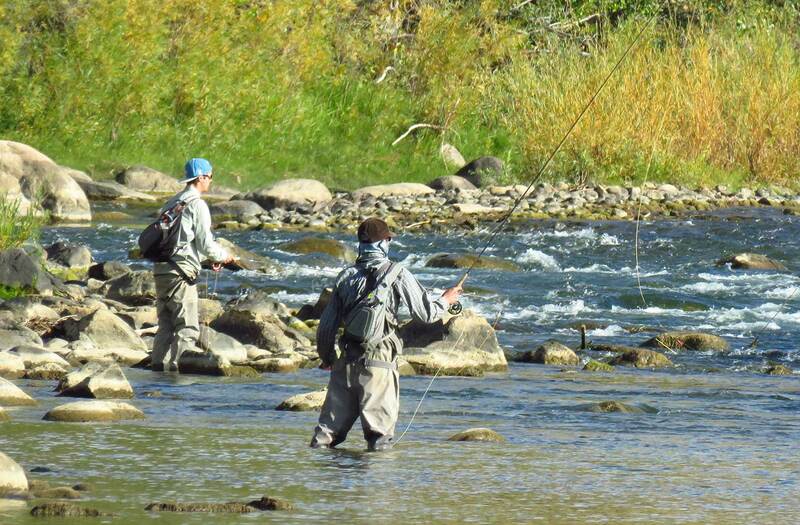 For inspiration, check out our video of fly-fishers on the Roaring Fork River near Basalt. Over 102 miles from the confluence with the Lake Fork of the Arkanas near Leadville to Cañon City, the Arkansas River drops nearly 5,000 feet in elevation and passes from sub-alpine meadows through bouldered canyons and irrigated hayfields before entering Bighorn Sheep Canyon below Salida. There, the river transects a high-desert environment that is home to its namesake sheep as well as a population of brown trout and introduced rainbows. With a warm and dry climate throughout the year and nearly 40 miles of public fishing access, Bighorn Sheep Canyon is the Arkansas' prime fly-fishing destination. Flows are supportive of wade fishing most of the year, and float fishing has become an increasingly popular way to work the shoreline pockets favored by brown trout. Fish: Rainbow trout, brown trout Directions: From Salida, drive east on US 50. The canyon continues east beside the river for roughly 40 miles. Damming the Gunnison River in 1965 created the Blue Mesa Reservoir, Colorado’s largest body of water, and a fly-fisher’s playground. With more than 96 miles of shoreline, finding a shady spot to cast a line is easy. Or, explore the acres of the pristine reservoir by boat. Deep-water areas are best for landing lake trout and brown trout. Brook trout tend to stay away from the deep open waters, but are often found feeding near the mouths of rivers and streams that flow into the reservoir. Rainbow trout are the most abundant in these waters and can be found in the reservoir and river areas. Fish: Rainbow trout, brook trout, brown trout Directions: From Gunnison, take Hwy. 50 west for nine miles. The section of river flowing from Durango to the New Mexico border has been classified as Gold Medal water, easily supporting populations of rainbow and brown trout 14–18 inches in length. The bends, log jams, boulders and eddies are prime spots to kiss the surface of the water with nymphs or streamers. One thing to keep in mind before you go: the Animas River runs through Southern Ute Indian reservation land in the south, and special permits are required to fish this section. Contact the reservation for more information on their requirements. Fish: Rainbow Trout, brown Trout Directions: Hwy. 550 south from Durango runs alongside the river. Southern Ute Tribe Division of Wildlife Resource Management: 970-563-0130. The Grand Mesa Lakes comprise more than 100 natural lakes and reservoirs with pristine alpine water. These bodies of water offer a wide variety of trout and are ideal if you want to try landing an array of species. Boating is allowed on some, but not all, of the lakes. Be sure to read posted signs before putting in. Dozens of fish-laden streams that also bisect the area are a good way to enjoy a piece of solitude when angling for your next big catch. Fish: Rainbow trout, cutthroat, brook trout, brown trout Directions: From Delta, head north along Hwy. 65. The Gunnison River, which eventually feeds into Blue Mesa Reservoir, teems with trophy-worthy trout. You'll have some of the best luck with nymphs. Drop a well-placed cast behind a boulder or look to eddies and strainers for a good chance to pull out a 16-inch trout. Due to these consistently large fish, the river has been give Gold Medal status — so be sure to pack your larger net. Historically, trout have been exceptionally large within the stretch of river between Crystal Creek and its confluence with North Fork. But you’ll have to hike in a little ways, as there isn’t a road to this section. Before it reaches the dam, the Gunnison River runs through the Gunnison Gorge National Conservation Area, so even if you leave empty handed, the scenery alone makes the trip well worth it. Fish: Rainbow trout, cutthroat, brown trout Directions: From Delta, take Hwy. 92 east for 11 miles until it intersects the river. Crystalline Steamboat Lake is defined by the scene-stealing quality of the needle-like Hahn’s Peak towering over the northeastern shore. But even this mass of earth can be forgotten when you're reeling in one of the lake’s many hard-fighting rainbow trout. A drift boat is prime for accessing the deeper sections of this 1,050-acre body of water. For those without flotation, fishing along the miles of easily accessed shoreline is a popular and effective option. Fish: Rainbow trout, cutthroat, brook trout, brown trout Directions: From Steamboat Springs, travel west on Hwy. 40 for two miles to CR 129. The park entrance is 26 miles north along CR 129. Located just off the Flat Tops Trail Scenic and Historic Byway, Trappers Lake is a piece of easily accessible wilderness, where pines ring the lake in thick swaths of deep greens. Gnats and the occasional mosquito are the food of choice for the lake’s native cutthroat trout — touted as the largest population of its type in the world. The lake itself is Colorado’s second-largest natural lake, providing plenty of room for fish to roam. Non-motorized floats are the way to fish this serene body of water. Because many of the insects emerge during dusk, try casting a gnat-shaped fly in the late-day sun. Fish: Cutthroat Directions: From Meeker, take Hwy. 132 (also known as the Flat Tops Trail Scenic and Historic Byway) east for roughly 45 miles. Imagine a placid body of water bathed in sunshine over the Colorado Plateau. Now envision your rod bending until it nearly breaks as you struggle to pull up a 16-inch rainbow trout. These scenes happen nearly every day here. Make use of the manicured boat ramp for easy put-ins, then speed over 66,000 total surface acres. When you’re all fished out, retire to your campsite — Wolford Mountain has 48 full-service sites, complete with electricity, trash removal, fire grates, picnic tables, a dump station, shelter and bathrooms. Fish: Rainbow trout Directions: From Kremmling, take Hwy. 40 north for six and a half miles. One of the most prolific trout fisheries in Colorado is found just upstream of Yampa River State Park, a testament to the area’s fantastic ability to foster fish. The eastern portion of the park, from Hayden to Craig, is well known by anglers as a treasure trove of trout. If you found you’ve met your quota of trout, which is common, look to the western end of the river from Craig to Maybell, where warm-water fish — including small-mouth bass, northern pike and catfish — can all be caught. For catfish, consider trading in your fly rod for a bottom troller. Fish: Cutthroat trout, brook trout, brown trout Directions: From Craig, take Hwy. 40 east for five miles to the turn off to the park toward Elkhead Reservoir.